The F.F. 's incorporation has to do with money, first making it and then keeping it. I know that talking about money is plebeian, even crass, and that super-heroes should be above that sort of thing. But they're not. It takes money to keep Johnny Storm stocked with hot sauce or to maintain Reed Richards' one hundred pairs of stretch socks. The F.F. has no trouble making money. Reed's patents, which supply the money, are of such number and quality that the Fantastic Four-or a small army in Bolivia-can live off of their sales and applications. Considering the F.F. 's expenses, however-the electric bill on the Negative Zone portal alone must he staggering and the Fantasti-car can't get good mileage-one can only conclude that Reed Richards has a patent on the letter E.
Keeping the money the F.F. makes is another matter, one in which incorporation would help considerably. First incorporation creates tremendous tax advantages for the Fantastic Four. Exactly how the advantages come about is complicated, so you'll just have to trust me on this one. I can't explain it to the lay public; mostly because I don't understand it myself. It has to do with who is liable for the taxes owed by a corporation versus those owed by a partnership. Partners in a partnership share the profits and are individually liable for paying the income taxes on said profits. A corporation, on the other hand, is a separate legal entity, a fictional person which is liable for the taxes on all corporate income. Thus, it is Fantastic Four, Incorporated which pays the taxes on the income generated by Fantastic Four, Incorporated, not Reed and the gang. The tax advantage that this situation creates comes with the realization that along with a patent of the letter E, Reed Richards obviously has political clout. Lots of political clout. Remember we're talking about a man who was able to swing enough zoning variances to permit jet plane landings, rocket ship take-offs, and nuclear generators in the Baxter Building, a mid-town Manhattan address only a few blocks from the United Nations building. All of that in mid-town Manhattan requires more pull than a Coney Island taffy concession. Reed must have enough connections, that he could get Congress to Vote itself a pay cut. With such pull working for him, Reed would have no trouble in getting the F.F. declared a non-profit organization. As a matter of fact, they are. Check The Amazing Spider-Man #1. The point of all this is that non-profit corporations do not have to pay income taxes, because they don't have any income. 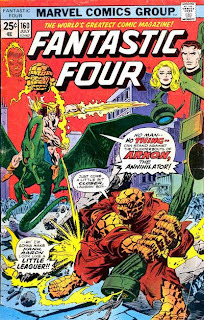 So if it is Fantastic Four, Inc. which is liable for the income taxes-not Reed, Sue, Ben, or Johnny-and if Fantastic Four, Inc. is a tax exempt non-profit organization, no one pays the taxes. Indeed, there are no taxes. And if you don't think there's a tremendous tax advantage on not having to pay the taxes on fifteen quintuplatillion umptuplatillion multiplatillion impossibidillion fantasticatrillion dollars, you need to study H&R Block's 17 reasons again. Saving on taxes isn't the only advantage that the corporate structure offers the Fantastic Four. There's an even bigger one in what's called limitation of liability. Your average super-hero/super-villain contest produces repercussions that don't go away, when the gendarmes cart off the bad guy. To quote from John Byrne in Fantastic Four #260 Page Panel 1, "Leaving [the site of the battle] will not prove quite so easy, the consequences of a major battle in the middle of a highly populated area being many. There are accounts both economic and emotional that will take years to settle." In other words, your average super-hero/super-villain contest levels your average city block. So when the F.F. trashes a supermarket, freeway and a taxicab in one issue, someone's got to pay far all that damage. Now imagine the Marvel heroes going through the same door. Iron Man would blast it with Repulsor Rays. Thor would smash it with his hammer and not even have to retrieve the hammer. Cyclops, Iron Fist, Power Man, Hulk, Thing and virtually everybody found in The Official Handbook to the Marvel Universe, volumes 5-11 would break down the door. This problem of destruction has reached epic proportions under John Byrne's run of the Fantastic Four and The Thing. Case in point Thing #6. Pages 18, 19, and 20, where Ben Grimm seems to have taken out one-third of mid-town Manhattan. Only the destruction to Tokyo in Toho Production's classic, Godzilla Vs. Mecha Ruta-Baga rivals Ben's clash with Puppet Master for pure mindless destruction. Your average super-hero/super-villain fight leaves your average super hero with a big law suit on his hands. Many times the hero would have a defense, the Doctrine of Emergency. This is a common law doctrine which most, if not all states, have adopted. It says, if a person causes property damage or personal injury while acting in an emergency-particularly a life threatening emergency-said person is not liable for said damage or injury. Constant reliance on this doctrine, however, is impossible. Remember the hero must be acting in an emergency and what was an emergency once might not be so forever. I can just picture Judge Wapner's ruling. "I'm sorry, Mr. Richards. I realize you destroyed Sea World of Orlando protecting the Earth from Galactus's recent attack. But this Court must also take judicial notice of the fact that Galactus has already failed to eat the Earth some forty-seven times to date. This Court rules that Galactus has proven himself to be ineffectual, incompetent and not an emergency at all. Judgement for Shamu." Even if the Doctrine of Emergency could he invoked over the damage caused fighting such notables as the Ringer or Leapfrog, the Doctrine does not cover all super hero caused damage. How many times have you seen the Thing get mad and rip up a Rolls? Or the Torch slag a pike in a pique? Several, right? So, when Ben Grimm levels Levitown in a jealous rage, because Silver Surfer was having tea with Alicia again, that wouldn't count. Reed Richards must have seen several persons whose property had been so destroyed file suit against the Fantastic Four, even if Smilin' Stan and Jolly Jack didn't show us the suits. Perhaps that's why the F.F. went bankrupt back in Fantastic Four #9. And, maybe they were feeling another monetary crunch in issue 160, paying for all the property the Thing and the Torch destroyed. Reed is, if nothing else, an intelligent, farsighted man. He saw that he had to insulate his personal fortune from the antics of this two-man wrecking crew under his command, before someone successfully sued him for not controlling them better. Incorporation provided the perfect insulation. A corporation, such as F.F., Inc. is a legal entity, which can be sued in a court of law. Moreover, the corporation, not the board of directors is liable for the wrongs committed by its employees. In other words, when your Chrysler blows up, because of a faulty frammistat-Frammistat? I'm a lawyer, Jim, not a mechanic-you could sue Chrysler. Inc. and win all its assets. You might even win its debt to the Feds. But you couldn't collect a cent from Lee Iacocca, because he's not personally liable. This nifty little legal loophole is, as I said, called Limited Liability and is the reason so many "suits" incorporate. In the event of a lawsuit, it saves them the shirts off their backs. (After all what good is a suit without a shirt? In the same way the Yancy Street Gang could sue Ben Grimm for the injury he caused them. They could sue Fantastic Four, Incorporated. But they could not sue Reed Richards. Reed gets to keep his one hundred pairs of stretch socks. So there you have it, the untold story behind the secret origin of Fantastic Four, Incorporated. Maybe next time I'll tell you the real reason that Bruce Wayne abandoned the Wayne Foundation. But if you think about it you should see. I mean would you want to head an organization that sends its top executives into an eastern European country just forty-eight hours before a major revolution. The liability potential there staggers the imagination.